The book Living without Fear initiated a series of dialogues between Jiddhu Krishnamurti (1895-1986) and Patrick Francis (Paddy McMahon). The dialogues continue in this book; the above is an extract from one of them. 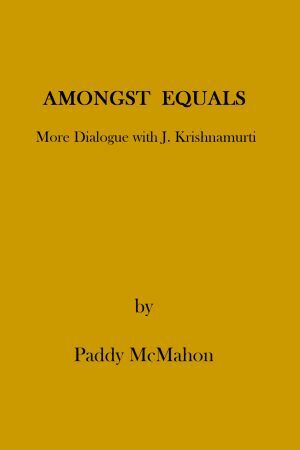 Excerpts from the book "Amongst Equals"
This is the second volume of a series of communications, commencing in October, 1998, which I have had with Jiddhu Krishnamurti (K), who "died" in 1986 at the age of ninety. I published the first volume in September, 2001, under the title Living without Fear, with a subtitle Dialog with J. Krishnamurti. I explained in the introduction to the first book how I came to be involved in what for me was a totally unexpected undertaking. I didn't have any difficulty about the idea of collaborating with an individual from the spirit dimension since that sort of activity had been a reality for me for many years, but doing so with somebody who had such an internationally famous reputation was a rather daunting prospect, to put it mildly. What do you do when you feel under pressure? I hand the whole situation over to my guides with total trust that the best solution for me will present itself. That's not a passive thing on my part. Having done the handing over bit, I take whatever action suggests itself, depending on how I feel about it. I'm open to the solution coming in any one of a number of ways - directly through inspiration, discussion, from reading, listening to a radio programme, looking at television, a seemingly chance remark made by somebody, or otherwise. I know that all I need to know is that the solution is in the offing; I can wait for the how of it. Whenever I allow myself to be pressurised it's because I have forgotten to take those steps. That's a simple procedure that works for you. One of it's benefits is that you have to keep an open mind or it won't work. If people are open-minded and allow themselves to be still, even for short periods each day, solutions will always present themselves. If they involve making seemingly radical change in existing circumstances, courage is needed. As always, there's choice; stay put, change. Sometimes, the change required may only be one of perception or attitude. Relevant questions may be: what do you want? ; what do you need? Your wants may be much different from your needs. Can you reconcile the two? You may think you want a bigger house, a place of your own, more money, or relationship with the "right" man or woman, and so on, but do you need those things? Would you be more joyful if you had them? Would they be enough for you, or would you still keep wanting more? If the "right" partner turns out to be the "wrong" one, would your new situation be worse than your old one? When we go into all this there's no end to the questioning. Eventually the questioning will stop only when internal security is reached; which, as you know, won't come from any external factors. If we go back to where we started from in this session, the people who feel pressurised because they have no leisure time obviously think they have no choice but to continue with their present lifestyle. The pressure comes from lack of security in themselves, rather than from the external factors of their jobs, etc. When they find inner security, they'll be free of the strait-jacket of thinking that locks them into a no choice situation.